Adding rewards for storing content files on IPFS. Adding a decentralized exchange with User Issued Assets and smartcoins. Building a peer to peer marketplace for product and service trading. Enabling Encrypted posts that you control visibility over. Every STEEM power and BTS holder will receive a sharedrop of the new WYM asset. WeYouMe combines blockchain social media, with a decentralized exchange and a peer to peer marketplace. Create. Connect. Earn. 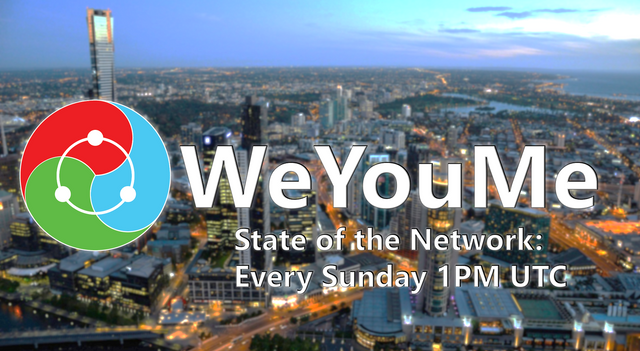 Join the WeYouMe Discord channel and tune in at 1:00PM UTC on Sunday 9th of August to take part in the next WeYouMe State of the Network discussion! Comment your question or topic, and it will be discussed live. WeYouMe has completed its preliminary Initial Coin Offering on Bitshares, using the asset EZIRA. No action is required from EZIRA holders, EZIRA will be converted to mainnet WYM at an identical 1:1 ratio. WeYouMe is conducting a private seed funding round. WYM rewards: Every account that holds WYM for 4 weeks and is active will earn MeCoin rewards. 20% of issued MeCoin will be distributed to WYM holders, to provide a reward for ownership. Network revenue: WeYouMe earns revenue from promoted posts, memberships, and trading fees. Proceeds are used to autonomously buy and burn MeCoin. 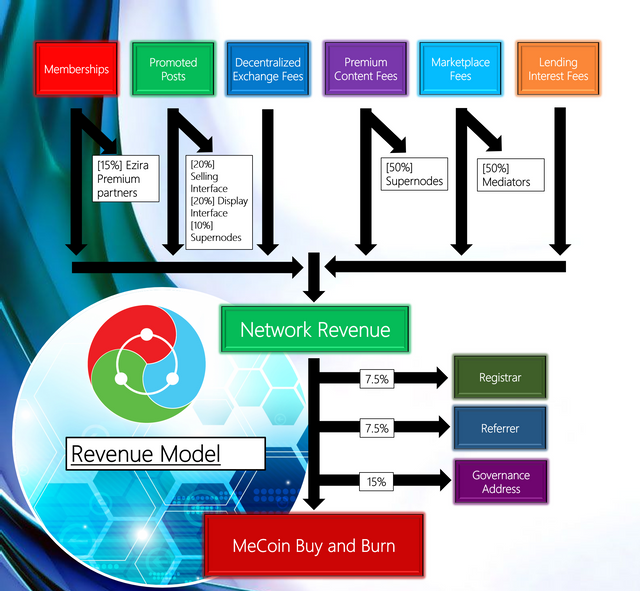 This increases the value of MeCoin, and benefits all ecosystem participants. 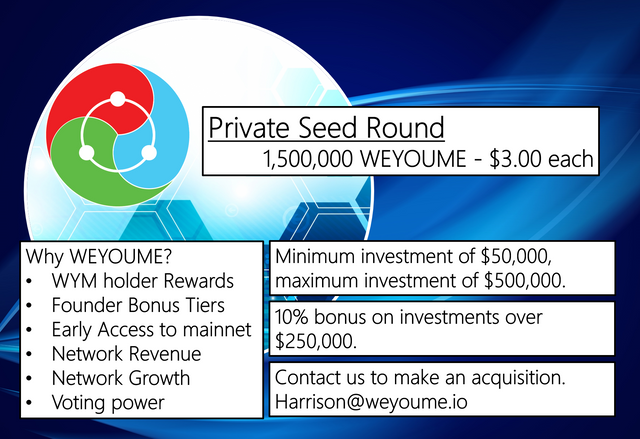 Network Growth: WeYouMe offers incentives for new users to be introduced to the blockchain. The growth in users represents a growth in the value held in the WYM asset to access voting power and network resources. WeYouMe is Powered by the Bitshares blockchain. Create your Bitshares address to hold your EZIRA assets, which will be converted into mainnet WYM. I'm a fan of Graphene based blockchains in general, and this project looks particularly promising. My main question is how the airdrop will be handled. Will all Steem and BTS whales become WeYouMe whales? Thanks for your post, Keep Steeming! Thanks for sharing this great article!!! That is a super article. Thank you. @dahaz159 This is one of the wonders that the blockchain brings with the cryptocurrencies to generate alternative income to the communities, democracy and universal income is on the way. I wish you the best of successes and I will follow you to be attentive to your content, greetings and luck! @sociohub Thank you for your supportive words. @printskill will always support you. Great article. It's very useful for me. Thanks for sharing. You got a 14.57% upvote from @postpromoter courtesy of @dahaz159! You got a 38.37% upvote from @upme thanks to @dahaz159! Send at least 3 SBD or 3 STEEM to get upvote for next round. Delegate STEEM POWER and start earning 100% from your share, daily payouts ( no commission ). This post has received a 59.14 % upvote from @boomerang. @dahaz159 purchased a 84.85% vote from @promobot on this post. The pictures are all that everyone needs to see. So I'm very happy to post and photographs. You got a 92.78% upvote from @upmewhale courtesy of @dahaz159! Nice my friend...i'm 100% human..i can upvote , comment & resteemed your every post future..If you like it,follow me and make a reply to this...asap i will 100% followback you.. I almost got fired from McDouches because I started bagging all the left overs and leaving them out for the homeless folks. Your post is beautiful, and very educative. And am not even surprised at the amount of vote you pulled. apart from the beauty of your post what else can be done to multiply ones vote. Your UA account score is currently 4.314 which ranks you at #2337 across all Steem accounts. In our last Algorithmic Curation Round, consisting of 236 contributions, your post is ranked at #97.
hi @dahaz159, its amazing what's top of the trending section, ads hey? Seems like an interesting project!! Awesome bro.. thank for sharing that nice information..
Why did you choose the Bitshares blockchain over others?